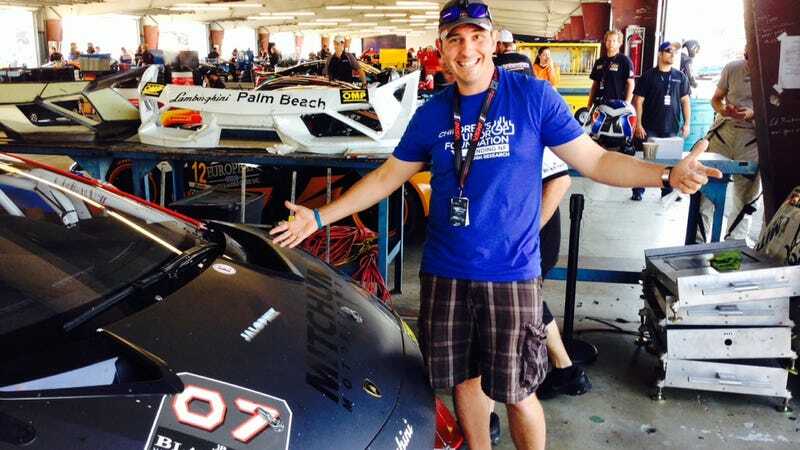 We're big fans of the Lamborghini Super Trofeo cars and we're big fans of Ryan Eversley, thus we were pleased when he stopped by our RV this morning to pick up a couple of Jalopnik stickers and check out where he put them! One is the #07 Lamborghini car racing in the Blancpain series (he finished second in it yesterday with his co-driver) and the other is his Racing 4 Research Honda Civic in the Continental Tire Challenge. You can basically count on a win from both cars today when they get the Jalopnik bump. Also, follow Ryan on Twitter because's he's got durn hilarious.